Join Us on Top of Moffat Road!!! Have an adventurous spirit? Do you enjoy hiking in breathtaking areas? Do you possess a general interest in History and Archaeology? If any or all of these things apply, then this is the project for you! For thousands of years, humans have traversed the Continental Divide by way of Rollins Pass, which connects the portions of Northern Colorado’s Front Range to its high neighbors to the west. Complicated and unique prehistoric landscape utilization systems included game drives and hunting blinds, and sites, both historic and prehistoric crisscross the high elevations. 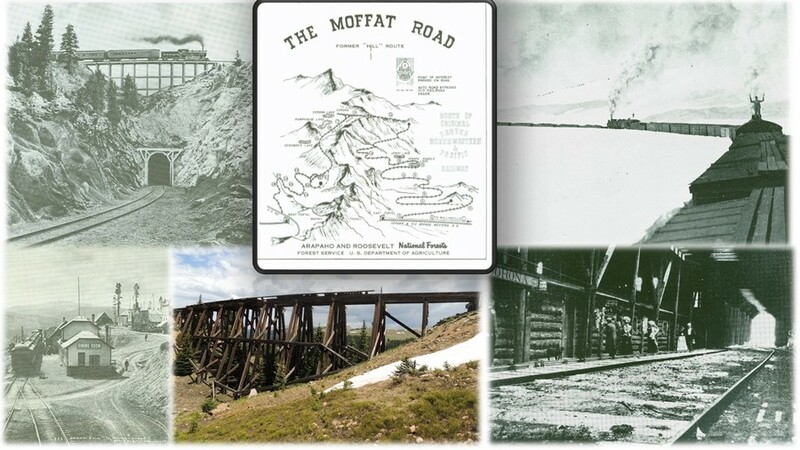 More recently (geologically speaking), locals witnessed railcars chug up, up, up, over, and through the domineering peaks along what is now considered “the highest standard gauge railroad built in the United States:” the 19th-century Moffat Road. Though much of the history behind Moffat Road is known, the railway itself has yet to be fully documented. The goal of this PIT project is to investigate the areas surrounding the railway and discover features that will fully illuminate and better preserve the route’s historic legacy. Volunteers will join Heritage Program staff from the Arapaho and Roosevelt National Forests/Pawnee National Grassland (ARP) for an archaeological survey along the known trajectory of Moffat road. We will search for features and artifacts that will help to tell its story, and we’ll take photos, make maps, and take detailed notes as we “hike through the past.” This is an important project amid some of the grandest scenery in the country, so we hope you’ll join us this summer!